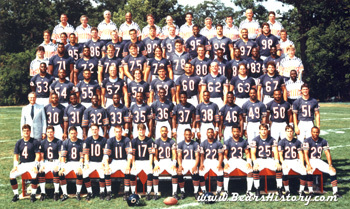 1991 Chicago Bears team photo. 1990 had started with a holdout, and so would 1991. This time, new starting quarterback Jim Harbaugh was holed-up, playing golf in nearby Galena, IL, waiting for a new contract from the team. Harbaugh actually was contacting reporters in Chicago, reasoning with them so as not to look money-hungry. Harbaugh's asking price was $1.4 million per season; in 1990 Neal Anderson was given what he was demanding. Harbaugh's demands were met, and he signed a two-year deal before camp broke. In '91, the Bears were still on top of the NFL, at least in popularity if not in the standings. The Saturday Night Live skit "Da Bears" had people all across the country pledging allegiance to the team. Chicago made its 3rd trip overseas since 1986 in the preseason, this time to Berlin to take on the San Francisco 49ers. The trip was relaxing for the players-but those types of excursions never lend to opening the season in a prepared fashion. Other distractions were taking away from the team that August. All-pro left tackle Jim Covert was out with ruptured disks in his back, and it was not known if he would return to football. Rookie first-round pick Stan Thomas, a questionable draft pick whom Mike Ditka was stubbornly opposed to taking at all, had an injured shoulder. All-pro safety Shaun Gayle had a problem with his leg, and both running backs Anderson and Muster were nursing sore hamstrings. And to top it all off, the "Refridgerator", William Perry, had balooned to an astonishing 370 pounds. With all these question marks, who would have known the team would turn in their most exciting season since 1985. The season started at home against the Minnesota Vikings. Minnesota had been a thorn in the Bears' side among generally weak NFC Central opponents, beating the Bears in 4 of the last 6 matchups. The game would pit Bears' rookie tackle Stan Thomas agains Chris Doleman-one of the best pass-rushers in the game. Chicago was dangerously weak at receiver, with Ron Morris out and rookie Anthony Morgan starting. No-name receiver Tom Waddle, who had been cut 4 times by the team, would play the slot receiver position. Chicago ground it out against the Vikings, and the defense played tough. Just before halftime, the slow-as molasses but sure-handed Waddle caught a 42-yard strike from Harbaugh, and Chicago took the lead. The Bears ended up winning 10-6, helped by last-minute heroics from Steve McMichael, who caused a Wade Wilson interception as Minnesota was driving in the waning moments. The following week, Chicago travelled to Tampa Bay, and LB John Roper gained player of the week honors for a two-sack performance as the Bears beat Tampa 21-20. On September 15th, the World Champion Giants invaded 90-degree Soldier Field in a game not many thought the Bears could win. Jim Harbaugh hit Wendell Davis on a 75-yard scoring strike, and Neal Anderson scored on a diving, 42-yard TD run, and the Bears led 20-17 with seconds left. The Giants lined up for a chip-shot field goal, but it was blocked by none other than the 370-pound "Refridgerator", clinching the victory over the world champs. The following week on Monday night, New York's other team, the Jets, came to Chicago. Observers noted that Chicago was not winning games in '91, but barely squeaking by. The same would occur on that surreal Monday night. Despite a 28 completion, 303 yard performance by Jim Harbaugh, and nine-catches by the clutch Tom Waddle, the Bears trailed the Jets, 13-6 with less than a minute left. As was beginning to be common in 1991, Chicago couldn't maintain a solid running game. Fullback Brad Muster had left the game early after re-aggrevating his hamstring injury. So New York settled in to run out the clock. Steve McMichael had different plans. He stripped Blair Thomas of the ball, and Chicago had the ball back in their own territory. Several plays later, Harbaugh, Waddle, Davis, and Anderson had the team 3rd down and inches from the Jets' one yard line. The QB attempted a sneak from the shotgun formation, and was stuffed just short of the goal line. With time for one final play on fourth down, Harbaugh rifled a pass in the flat to Neal Anderson....TOUCHDOWN! as time expired. The game went into overtime, and New York drove down the field to attempt an easy, game winning field goal. Not much of the crowd had left, despite the situation looking grim. In another freak twist of fate, the Jets blew the field goal attempt. Fate gave Chicago one more shot, as time was winding down in the extra period. Several passes later, Harbaugh hit tight end Cap Boso on a rollout, Boso was driven over the goal line, popping up with a face full of sod. The Bears had won the game, and they headed into the locker room full of jubilation....or so they thought. The officials ruled Boso down at the one-yard line, and the players were called out of the locker room to get back on the field. Finally, Jim Harbaugh scored on a sneak, and the Bears had won a game they shouldn't have by the score of 19-13. The team was 4-0. After the Monday night madness, the Bears were faced with playing 1991's Super Bowl teams, Buffalo and Washington, in back-to-back games. Despite beating both teams statistically, they lost both games on the scoreboard, and were suddenly 4-2. Then came another 5 game winning streak featuring a shutout of lowly Green Bay, and a shocker at undefeated New Orleans. After this streak, the team stood at 9-2, then they lost 2 more to fall to 9-4. Two more wins brought them back to 11-4, and a season finale matchup at San Francisco. The finale by the bay was significant. If the Bears won, they would finish 12-4 and win the Central for the second year in a row over Detroit by virtue of a tiebreaker. If they lost, they would finish as the wild-card team, and may eventually have to travel to Detroit for a rematch in the Silverdome. The Bears controlled their own destiny, and were facing a 49er team that did not make the playoffs, and was playing with backup QB Steve Young. The Monday night audience settled in. This audience was bombarded with live shots of Wayne Fontes and the Detroit Lions in the Silverdome restaurant, hamming it up in hopes of a Bears loss. And the Bears did lose, 52-14 in one of their worst defeats under Mike Ditka. With each Bears mistake, ABC would cut to a cigar-smoking Fontes, rubbing in the frustration to a national TV audience. Chicago returned home and hobbled into the wild-card game against the Dallas Cowboys. Dallas had finished 1-15 just two years earlier, but was loaded with young talent. The Bears finished the 1991 season in less-than-spectacular fashion, losing to the Cowboys 17-13. Chicago had made four trips inside the Dallas 10-yard line, but came away with only one touchdown. Neal Anderson was held to 34 yards rushing, the aging offensive and defensive lines looked tired, and despite the electrifying atmosphere of the 1991 season, many questions faced the team going in to 1992. Perry blocks FG for win. Passing: Jim Harbaugh-The five year veteran became the first Bear quarterback to start all 16 games in a season since Vince Evans in 1991. He finished with a respectable 73.7 QB rating, threw for 3121 yards and 15 touchdowns. He also ran for 338 yards and 2 scores. Receiving: Wendell Davis-Davis had his best professional season, catching 61 passes for 945 yards and 6 touchdowns. He led the team both in receptions and yards. Scoring: Kevin Butler-Butler had a distracting offseason prior to 1991, but led the team in scoring with 89 points. Interceptions: Lemuel Stinson-Led the team with four interceptions. Stinson had been on his way to the Pro Bowl in 1990 before tearing knee ligaments. He bounced back strong but was not as electric. Jim Harbaugh started all 16 games at quarterback. Neal Anderson missed three games and only started 13 due to hamstring problems, backup Mark Green filled in. Brad Muster missed 5, also with hamstring problems, and James Rouse started in his place. With Jim Covert's retirement, rookie Stan Thomas started 7 games, but John Wojciechowski played the majority of the year. The rest of the offensive line was stable, but aging. On defense, most of the starters remained the same from 1990. From left to right: Offense Jim Harbaugh, Neal Anderson, Brad Muster, Wendell Davis, Tom Waddle, John Wojciechowski, Mark Bortz, Jay Hilgenberg, Tom Thayer, Keith Van Horne, Jim Thornton, Kevin Butler. Defense Richard Dent, Steve McMichael, William Perry, Trace Armstrong, John Roper, Mike Singletary, Jim Morrissey, Donnell Woolford, Shaun Gayle, Mark Carrier, Lemuel Stinson, Maury Buford. The 1985 Bears became worldwide phenoms, largely (no pun intended) due to the emergence of rookie "character" William "Refridgerator" Perry. Perry's luster had worn somewhat by the late 1980's, but coach Mike Ditka's had not. In 1988, New York native Robert Smigel first performed a sketch on stage in Chicago that depicted three Chicago sports fans sitting on a porch, discussing their teams. In January 1991, prior to the Bears' playoff loss at New York, the first "Superfans" skit appeared on Saturday Night Live. Throughout 1991, '92 and even 1997 the parody of Chicago fans was repeated, giving rise to the almost universally known term "Da Bears". In '91, the sketches featured the Superfans arguing with oddsmaker Danny Sheridan over just how badly the Bears would beat the Giants, and later that year had Michael Jordan at their table talking about "Da Bulls". During the 1992 season, the Superfans found themselves all laid up in Halas Memorial Hospital, where Chris Farley's character had a near-death experience from a heart attack. Finally, when Mike Ditka was fired the fans wrote a letter to Michael McCaskey, renouncing their allegiance to the team. (My father literally did this and has never returned, by the way). The final Superfans sketch aired in 1997. The Superfans mania was so acute in 1991 that Smigel and actors Chris Farley and George Wendt appeared on field and in character for the Dallas playoff game. In April 1991, Notre Dame defensive tackle Chris Zorich, Lombardi Trophy winner and Chicago native, told the media he would pay the Bears for allowing him to play for them. Just a figure of speech, he said, but he made no secret of his desire to play for his favorite team with his football idol Mike Singletary. Coach Mike Ditka developed a soft spot for Zorich and wanted to select him in the first round. Player personnel boss Bill Tobin and CEO Michael McCaskey insisted on instead selecting Texas offensive tackle Stan Thomas. Chicago still got Zorich at the end of the second round. Ditka said he was happier to have Zorich than #1 overall pick Russell Maryland, taken by Dallas. While Zorich was an idea citizen, Thomas was known more for his mouth and lack of work ethic. Following the 1990 Cotton Bowl, Thomas had declared in the media that Texas would have won the game had "the other 10 players played as good as me." Ditka has made no secret since his 1992 firing that the Thomas pick was forced on him by McCaskey, who called Thomas the "last of the big men." Ditka called Thomas a "wothless bum." The tackle would be victimized in a drive-by shooting in 1992, cut by the Bears in '93, out of football by '94, and accused of sexual assault in 2004. The pick was made for depth and development, but after Pro Bowl tackle Jim Covert was forced to retire with a ruptured disk in his back, Thomas would be forced to start in his rookie season. Following countless false start and holding penalties, he was benched for veteran John Wojciechowski. The Bears even traded a 1992 eighth-round draft pick to the New York Jets for backup tackle Ron Mattes, who did not play. Speaking of trades, in the offseason Chicago traded cornerback Vestee Jackson to Miami for tight end/defensive lineman Eric Kumerow, a former first round pick. Kumerow was also a Chicago-area native, and ruptured his achilles tendon in his first Bears action. He was lost for the season and never would play a down for the Bears. That injury occurred in the Bears' "American Bowl" game against the San Francisco 49ers in Berlin, Germany. Ditka was asked at a press conference if he felt like he was an ambassador of the NFL. His response? "If I am an ambassador of goodwill for the world and for the galaxy and for the heavens, I enjoy that role. That is why I was put here. Many years ago, somebody said that in August of the year 1991 AD, Mike Ditka is going to be in Berlin. And I am here. But I'm still looking for the guy who said it." Ditka then went on to express disdain for the cosmopolitan city of San Francisco. Fifth-year veteran Ron Morris was expected to start the season opposite Wendell Davis, but a knee injury landed him on injured reserve for much of the season. Rookie Anthony Morgan started the season opener but was also injured. This left the door open for Tom Waddle, who had been trying to stick with the team since 1989 but had been cut multiple times. Waddle's acrobatic touchdown reception in the opener began his trip as a local celebrity. Waddle also caught the game-winning touchdown pass against New Orleans, caught 8 passes for 102 yards against the Jets, and set a Bears playoff record with 9 receptions for 104 yards against Dallas. Offensive coordinator Greg Landry had designed a new passing offense to be implemented in 1990, but due to a long bout with viral incephelitis the implementation was scaled back. Landry was back calling all plays in 1991 and their passing offense rose to be ranked 13th in the NFL as opposed to 28th in 1990. Their rushing ranking dropped from 2nd to 9th. The Bears started the season with a stellar 9-2 record, but finished 2-3, culminating in a 52-14 humiliation on Monday Night Football at San Francisco. During the game Detroit Lion coach Wayne Fontes was pictured with some of his players watching the game on television, smoking cigars and rubbing it in. The Lions won the NFC Central due to the Bears loss. Following the playoff loss to Dallas, Ditka remarked to the media that perhaps he was playing with a group of overachieving players lacking talent, a comment that did not sit well with the team. The Dallas Cowboys continue to reap the harvest that the Minnesota Vikings sowed on the Herschel Walker trade, selecting several more players that would key future Super Bowl wins. After peaking in 1990 with a 12-4 record, the LA Raiders begin a slow slide by selecting QB Todd Marinovich in the first round. The highly touted Marinovich became a complete bust in the league. The Atlanta Falcons draft QB Brett Favre from Southern Mississippi in the second round, thwarting NY Jets' personnel man Ron Wolf's last minute attempt to trade up for the signalcaller. Favre never sees the field in Atlanta as coach Jerry Glanville thinks too highly of incumbent starter Chris Miller. The Detroit Lions surprise the league with a 12-4 record, winning the NFC Central and advancing to the NFC Championship game. The NFC wildcard round showed the changing of the times, where the young Dallas Cowboys knocked off the aging and slow Bears. Dallas lost in Detroit the following week. Washington beat the Lions, and Buffalo beat Denver in the conference championship games. Washington defeated Buffalo 37-24 in Super Bowl 26.